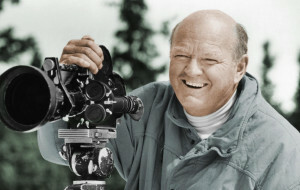 The official documentary on the extraordinary life of groundbreaking ski filmmaker Warren Miller is nearing completion in 2018 by a production team led by Lorton Entertainment, BoBCat Studios, and O’Malley Creadon Productions. The film, directed by award-winning filmmaker Patrick Creadon and produced by Christine O’Malley and Jeff Conroy, contains the last on-camera interview with Mr. Miller before his death last month on January 24, 2018. The documentary explores the personal and professional life of Mr. Miller as well as the forces that drove him to the heights of success in the ski filmmaking world. Miller, who was born in Los Angeles in 1924, recalls a childhood riding his bike up to the Hollywood sign, surfing in Malibu, and delivering newspapers to Walt Disney on his daily paper route. Following the draft of 1942, Warren entered the Navy for several years before moving to the mountains, living out of a teardrop trailer in parking lots of ski resorts as a self-described ski bum. Warren’s humble beginnings as a ski instructor gave way to a fifty-year career as a cinematographer, producer, and director of over 500 action sports films.